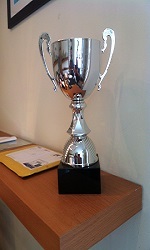 is everyone ready for yb racing, are you training ...? I`m behind (as usual) , not started training yet, ut will do this week......will miss the first yb race and hope for the second, which is from the same place. Very wise David, no point rushing them. Mine have had 6 tosses, they’re ready to go this weekend, I will hopefully get another toss into them if it cools down a bit. 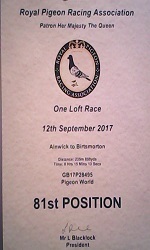 Just as an experiment why not, not train some of the young birds just give them more flying around the loft and see if there is any difference in the results, when sent to the race, between those sent up and down the road. mine arnt flying too good around home, if they were I`d be confident on them racing / training ok, they seem more interested in pairing up. I feel for you Darren, it must be heartbreaking, they’re like our little mates arnt they. What fanciers should be concentrating on is WHY ARE SO MANY PIGEONS SICK, all problems have a cause and in our sport it is caused by the action of fanciers in one way or another the pigeons react to the manner they are treated in every respect so someone is doing something wrong in the first place. No good complaining after the horse has bolted learn to fasten the stable door and the horse is confined. Hi David, im not ready, I've just been letting my 1st round out for about 3 weeks and there not even packing yet, 2nd round have been out for the 1st time last Sunday just opened the trap and let them do as they pleased. So I won't be sending for a while. me neither , I think it might be the third race from Leicester by the time mine are ready, got to vaccinate them yet, then start training ........so wont be in no rush to throw them away. they not even exercising well round home, more interested and pairing up. chuda, who vaccinates your birds...? I wish I knew why they get sick Misty, for the last 3 years my pigeons are 100%, and training well. I put them in the first race, and by about Tuesday a few don’t come down for food, then the next morning they’re sicking up. Then that’s my racing over. what natural anti-bacterial would you use Darren...? Wish I could tell you what the problem is, in many cases the pigeon would have to be able to speak. Many fanciers just guess and some make matters worse. I honestly never had any health problems and never gave any preventative nor any of the products the commercial boys advise as a means of winning races. I kept entirely to what the pigeons digestive system was created to cater with. The immune system is not built in a day but over many years and can be more easily ruined than improved by using artificial products. If you are having trouble then why not just try another system of feeding, no additives, just a sound well balanced diet, put some garlic in the water every day, just crush a couple of segments and put it in the drinkers, I never actually measured anything, no wild bird eats exactly the same amount each day and they do not do badly. The birds drank the garlic water when the pond water was available and had to be topped up every day. But for health, and I know that lime is the best means of dealing with many potential health problems, I actually learned this from the book written by a chap in prison who bred canaries, you cannot beat experience and actual events. I had sand and lime deep litter but I also always dusted the nest boxes and the perches with lime and just brushed it in with my hand, you will always get the doubters, I feel that the deep litter was actually the reason the pigeons never had any health problems along with the garlic. Of course if you abuse a method and cannot take the time to see that the lime is not a problem to you when using it then ??? ?, but belive me there are more fanciers than you think who use both the above. Hope your problems soon disapear. 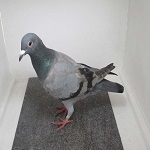 I vaccinated them myself with the help of Stuart H, and I do them just after I wean them so I know that every pigeon is done before they are let out. thanks for the info r/rog, is this made into tea ...? I have not vaccinated for over ten years. ACV occasionally in the water. Cleaned out yesterday one OB loft. Diatamaceous Earth powder down. Same as I did the stock birds few days ago. Have all been on shavings or straw etc,. Have another loft to do then young bird loft. They have just come back from exersise flight. Let them out at 7 am now 9 am. Killed one week or so ago. Busted leg, Another two with bruised legs. They will recover. Two hens are on eggs. Have been for a week. Others mating etc,. Will train tomorrow. Hot and humid but so will be some of the races. Lose them now or lose them later. Half a dozen were down on the gravel yesterday eating spilled soy bean seed from the planter. Bright red seed. Colour comes from the treatment the seed gets before planting. Pesticides. Will they get sick? No idea. Wild birds and wild pigeons eat the seed. Have not seen dead birds around. As stated, will clean another 8 x 8 loft. OB's 12 boxes. Then move some old birds. Then open the connecting door to the young bird loft. They can use both. That will give them 16 feet x 8 feet to play in. so I could just put ropa b in the drinker ? Robert Stroud etc I take it Misty with his old dirt trick there. Next you will tell us here you took notice of Levi also like me, with his small; loft/pen, of 20,000 odd pigeons as such .